It’s no secret that many western brands that manufacture on a large scale have long relocated the actual assembling of their products to the Far East to keep costs down. In most cases, the product development and design happens in the home countries, though, so I was curious to find out what a native-Asian pedal might sound like. The Mooer Bass Sweeper is a small-format pedal with a similar footprint to pedals such as the TC Electronic Ditto Looper and their range of TonePrint Mini pedals. 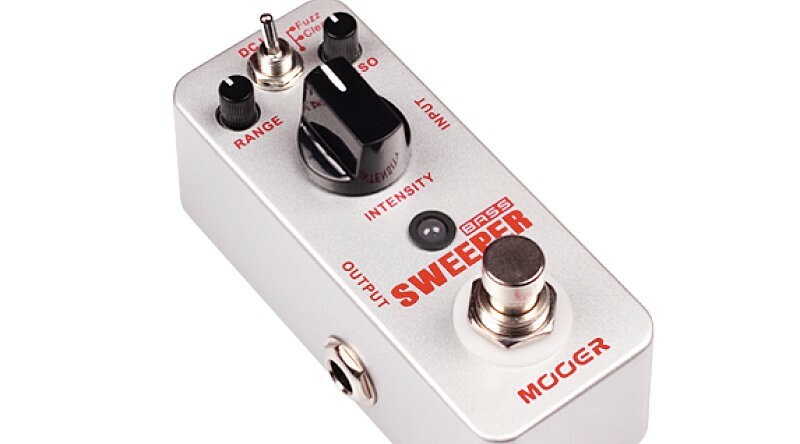 However, Mooer managed to squeeze three knobs and a 2-way toggle switch into the Bass Sweeper. The large knob is labeled INTENSITY and the two small knobs control RANGE and RESO(nance) respectively. 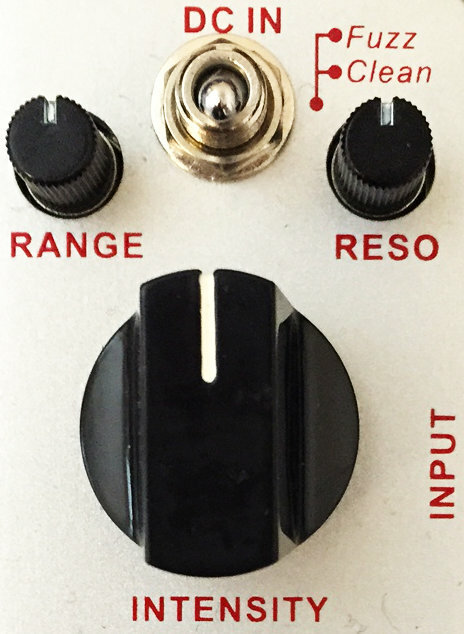 The toggle switch allows you to choose between a clean sound and adding some Fuzz to the mix. Obviosly, you will also find an LED that indicates whether the pedal is engaged or not, as well as a footswitch. On the top rear side, you will find the power supply input which is a standard solution accepting 9V with negative tip polarity. The standard Boss pedal design. On either of the rear sides, you have the INPUT and OUTPUT jacks as you would expect. There are 5 rounds of sound clips in this review. The first 3 take a methodical approach, zooming in on one knob at a time. The two other knobs are dialed in at noon, while the control under the scope is turned gradually. The last two rounds are demonstrating various settings – at first with the clean tone and finally with the Fuzz circuit kicked in. The ‘sweeper’ effect is obviously a filter effects, but it is also capable of creating tones resembling phasing and flanging to some degree. It pretty much does as advertised – it applies a sweep of modulation of which you can control the range and the resonance filter. 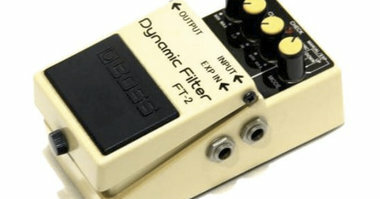 The Sensitivity control is not a ‘more-or-less’ effect, but rather it appears to affect the depth – or if you choose the Fuzz setting, it also affects that. During the creation of the sound clips, I think I found quite a few quite diverse uses for this pedal. From gentle sweeping mod-like effects to more wah-like tones and fuzz sounds that are also able to step into the territory of synth-like sounds. Especially if you team it up with an octave pedal like I did in the last sound clip, which only scratches the surface of the cool tones you could potentially create with this pedal and basically any octave pedal you should happen to have already or be able to get your hands on. 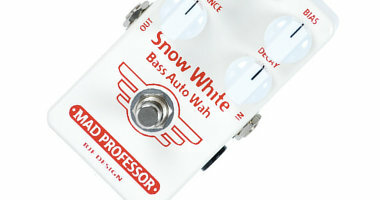 So, at the end of the day, yes, I find this pedal very versatile. You can make a lot of useful and fun tones across a broad range of expression categories. So far, I must say I have been pleasantly surprised with this tiny pedal. Despite the low price (more on that later), I didn’t find any indications that the quality should be significantly lower than other non-hand-built pedals on the market. Everything felt good. From knobs to switches and connectors, there was a solid feel to everything about this pedal. Not that it means anything necessarily, though, the weight was also comparable to other pedals of a similar physical format such as TC’s Spectracomp and Ditto Looper or even the hand-built T16 Octave from COG Effects. Designwise, it is well laid out and the learning curve is not very steep. 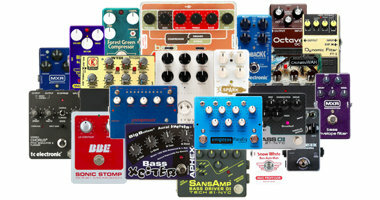 Just dig in and start tweaking – most knobs will pretty much do what you expect them to. The INTENSITY knob may be the one exception, but you’ll quickly find your way around it anyway. 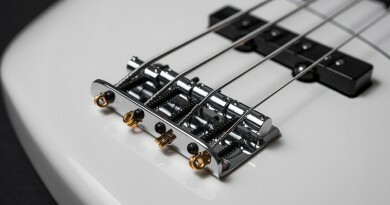 It’s pretty clear that the small knobs are meant for finding a fixed setting that you should not change on the fly, whereas the large knob is easy to give a quick notch mid-song. Would it have been nice to have the Resonance filter control on the big knob? Yes, sometimes it would. But then again, the Sensitivity parameter also fits this spot nicely, and given the size of the pedal, there is only room for one large knob. The alternative would probably have been three knobs that would have been somewhere in between the large and the two small knobs in terms of size. These would have made it easier to change any parameter on the fly, but not as easy as the single large knob. Overall, I am fine with the knob design, and for the most part, I would expect to set a basic tone that only needed very little adjustment on the stage anyway. Finally, the physical placement of the connectors also makes good sense. I have sometimes mentioned when there may be a potential clash of angled cables if the connectors are placed too close to each other. So it would also be fair to mention it when this is not the case, and on this pedal each input and output connector has one side of the pedal exclusively, so despite the small format, there are no issues hooking it up in your setup. Today (2016), the Mooer Bass Sweeper is available at around $69, which definitely puts it in the impulse purchase category. 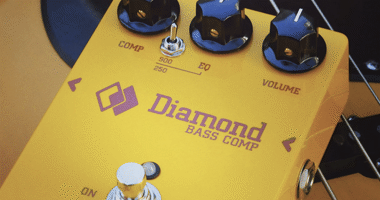 When you add it all together – the features, the tone, the quality, the design and the price – I have absolutely no problem claiming that this pedal offers a lot of value for money. 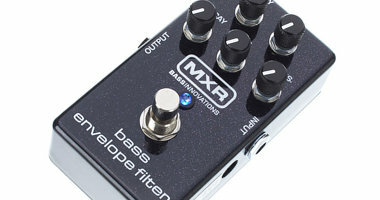 If you are looking for this kind of modulation effect, the Bass Sweeper is definitely worth checking out. Or if you just feel a bit like experimenting or feel the need to spiff up your octave pedal synth tone up, this could be the answer as well. In short, it sounds great, feels good in terms of quality, is well-designed and it offers great value for money. good review but does it sweep up or down? Thanks. It depends… If you set the range and resonance for a more ‘quacky’ wah effect, the filter kind of opens which gives it a sense of an upwards feeling. But if you set it to have more of a gentle flanger-like sweep underneath, it feels more like a very quick peak up and then a downwards swell. I am not sure if this makes sense, but if you haven’t done so already, please check out the sound clips (preferably wearing headphones) and listen closely for how the filter-sweep/modulation sounds.